Once the division point between East and West Berlin, Mauerpark is now a large urban green space in the heart of the city. Literally translated, Mauerpark means “Wall Park,” as it was once where the Berlin Wall and its death strip divided the city. Tourists and locals gather in the park for many events and activities, particularly on Sundays. Six days out of the week, Mauerpark is a typical city park for families, sunbathers, joggers, and cyclists to enjoy. 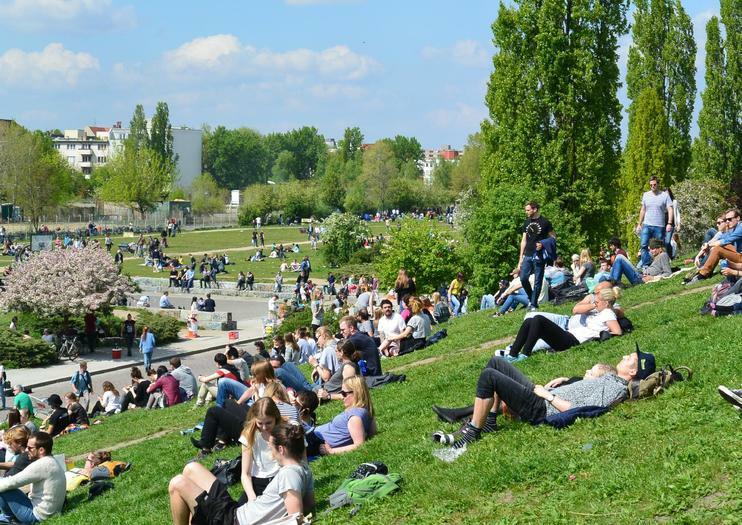 On Sundays, however, the entire park transforms into an open-air space for s flea market, food stalls, and the famous Mauerpark Bearpit Karaoke. Sift through relics from the GDR era, vinyl records, and other trinkets for sale, or watch brave souls sing their hearts out to their favorite tunes at the amphitheater. Tours to Mauerpark are generally focused on Berlin’s Cold War history and what city life was like while the Berlin Wall was up. For a more in-depth look at the Berlin Wall and its history, explore the city on a small-group or private bike tour. Mauerpark is a must for outdoor enthusiasts and thrifty shoppers. There is little shade in the park, so wear a hat or sunscreen in summer. Bring a blanket and picnic to relax and enjoy a comfortable day at the park. The paths in the park are either cobblestoned so it is advised to wear comfortable shoes to walk around the uneven services. Many parts of the park, including the Sunday flea market, are accessible to wheelchairs and strollers. Mauerpark is located in Berlin’s Prenzlauer Berg district along Bernauer Strasse. Take city bus 247 or tram M10 to the Wolliner Strasse stop, right in front of the park. Alternatively, take either the U2 to the Eberswalder Strasse stop or the U8 to the Bernauer Strasse station. Sunday is the best day to visit Mauerpark, when it’s bustling with people, vendors, and festivities. The flea market is open from early morning, and the food stalls start serving around lunchtime. Bearpit Karaoke takes place at approximately 3pm from spring to autumn, weather permitting. Spend a relaxing Sunday in Berlin exploring Prenzlauer Berg. Start off with brunch at one of the many cafés and coffee shops in the area. Then head to Mauerpark to peruse the flea market, enjoy a snack, and listen to some karaoke. From there, learn more about the history of the Cold War at the Berlin Wall Memorial, and then end the day exploring the Kulturbrauerei, a former brewery that has been transformed into a lively cultural center.